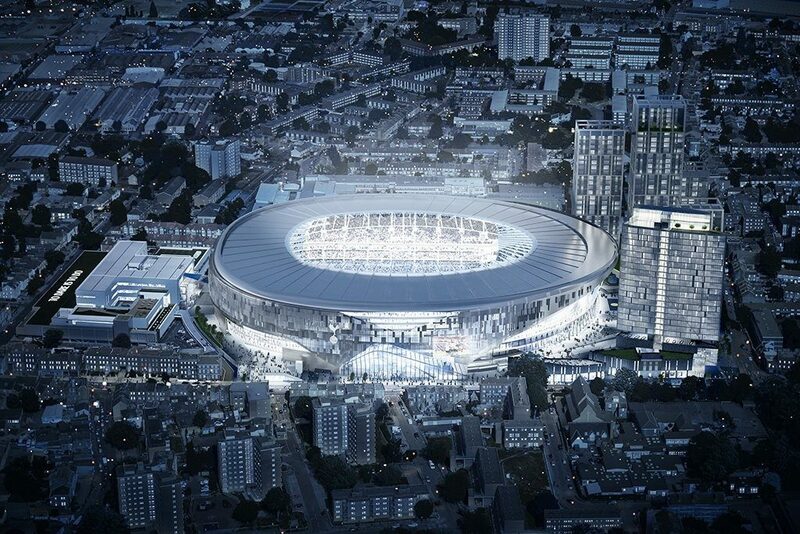 Full screenTottenham Hotspur new stadium Night image stadium exteriorThe capacity of Tottenham Hotspur’s new £800m stadium is to grow after an application to increase its size was accepted by Haringey Council. The club’s initial planning application was for a 61,461-seater stadium but design changes to the roof and seating layout has meant that an extra 98 seats can be installed in the ground. After submitting an amended planning document to Haringey Council the changes have now been given the go-ahead by its planning officers.A club statement said: “Improved seating layout design has meant that we have been able to increase seating in several areas of the stadium. This will now see our official capacity rise to a total of 61,559.” According to Spurs, the biggest change will be in the stadium’s South stand, which under the new plans will be able to accommodate 17,500 spectators, an increase of 500 from original plans. Spurs’ £800m new stadium takes shape. Major development work is well under way at Tottenham Hotspur’s new £800m stadium, see CN’s gallery documenting progress. When originally drawn up the new stadium was expected to hold 56,000 but this was revised up to 61,461. It will be the biggest in London and have more than 1,000 seats more than Arsenal’s 60,432 Emirates stadium. Mace was appointed as main contractor project in November 2015, beating Multiplex and Sir Robert McAlpine to the job. Since then the construction costs for the stadium have skyrocketed from a reported £400m in 2014 to £800m earlier this year, with the club attributing this partly to design changes and Brexit.Construction is expected to be completed next year, with Tottenham playing at Wembley next season as the existing White Hart Lane stadium is demolished. The UKconstructionmedia has posted the following information about this video: Tottenham Hotspur has released a stunning new video revealing what their new stadium will look like once it’s completed in time for the 2018-2019 season. Work has been progressing throughout the season on the 61,000 capacity stadium, which will replace White Hart Lane’s current home. The cost of construction for the project is estimated to be around £ 400M and the club’s new home being built around the existing stadium, which has resulted in a reduced capacity for White Hart Lane. Due to this method of construction, the club will play their home games at Wembley Stadium for the 2017 – 2018 campaign. The stadium will feature a retractable pitch that will allow the ground to play host to NFL games and events such as live music concerts. The animated video also shows big screens located in the four corners of the stadium.The club also launched a new website that features a live webcam and timelapse videos to allow fans to keep up-to-date with the construction progress. Spurs are currently riding high as they chase down fierce rivals Chelsea at the Premier League summit. Spurs Chairman, Daniel Levy commented: “Our stunning new stadium design and wider scheme will deliver an unrivaled fan experience and significant community benefits – creating a world class sports and entertainment destination for all – and in our birthplace of Tottenham. “It will be our new home for generations to come and we want it to be exceptional”.